Life upon the wicked stage, as captured in hundreds of show posters, photographs, design sketches, caricatures, set models and costumes, will be the subject of RED, HOT & BLUE! A SALUTE TO THE AMERICAN MUSICAL on view at the National Portrait Gallery in Washington DC from October 25, 1996 through July 6, 1997. Jointly organized by the NPG and the National Museum of American History, RED HOT & BLUE!, which takes its name from the title of Cole Porter's ebullient 1936 musical comedy, showcases the Hollywood and Broadway musical from its immigrant roots in nineteenth - century vaudeville through its heyday on Broadway and the Silver Screen, to its role in today's popular culture. Divided into five sections from 1866 to the present day, RED, HOT & BLUE! is a collective biography that includes many of the musicals and authors we are proud to represent. As part of their vast research for memorabilia, curators Amy Henderson and Dwight Blocker Bowers first met with this office in 1990 and were soon collecting manuscript and performance materials in consultation with the families of Richard Rodgers, Oscar Hammerstein II, Irving Berlin, Lorenz Hart and others. Artifacts in RED, HOT & BLUE! 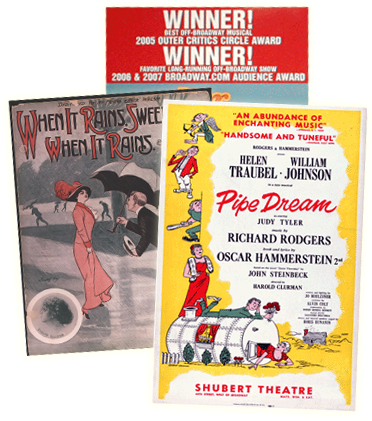 will include the set model for Florenz Ziegfeld's original production of SHOW BOAT (1927), design sketches for OKLAHOMA! 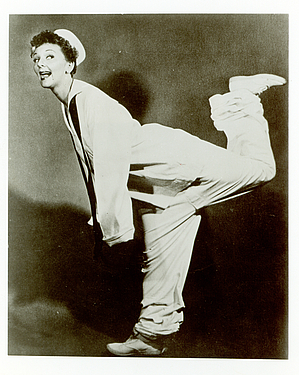 (1943) and CAROUSEL (1945), Oscar Hammerstein II's writing desk, Irving Berlin's transposing piano, his soldier's uniform worn while performing "Oh, How I Hate to Get Up in the Morning" from THIS IS THE ARMY, and Mary Martin's over - sized sailor suit for SOUTH PACIFIC's "Honey Bun." Featured in the exhibit, from the NPG's permanent collection, will be William Franklin Draper's oil portrait of Richard Rodgers (painted in 1970 - a replica of which hangs permanently at the Richard Rodgers Theatre on Broadway), Boris Chaliapin's 1947 portrait of Oscar Hammerstein II, painted for the cover of Time Magazine (donated by the Hammerstein family during a Hammerstein symposium last December), and Neil Estern's bronze profile of Irving Berlin, commissioned by the Berlin family in 1994 for the Music Box Theatre on Broadway and donated this year. An ambitious exhibit for an ambitious topic, RED, HOT & BLUE! will juxtapose visual materials with audio - video compilations, on - going documentary screenings, etc. It will be joined by a series of public outreach programs and lectures on various themes in the American musical, and has also inspired a lavishly - illustrated 300 - page book, a CD - ROM, and a 4 - CD set of archival recordings. For more information contact the National Portrait Gallery at 202 - 357 - 2700, or on - line at www.npg.si.edu.